Everyone in the world of skiing has heard of the Three Valleys, and for good reason. Surrounding visitors with awe-inspiring scenery and world class resorts, this internationally revered skiing area remains to be of huge importance to seasoned professionals and newcomers alike. Consisting of the valleys themselves, namely Saint-Bon, Allues and Belleville, this is the largest skiing area in the world, which includes the famous ski resort Courchevel and Méribel. All three are accessible by connected lifts, with a wide range of slopes, activities and events to carve your skis into all year round. From the restaurants to the accommodation, the reasons for visiting the Three Valleys are endless. To help save some time, we’ve narrowed down our top five reasons to visit the Three Valleys so you know what to expect. With its vast size and scale, you won’t run out of piste options or ski runs during your time at the Three Valleys. You’ll never need to descend the same piste twice either, as there is so much to explore and descend. All these different options mean everything is always fresh! It also allows you to be choosy when it comes to resort options. Eight different locations provide enough choice to ensure you find the essential, perfect place that suits you. You’ll want the perfect accommodation to keep you cosy too, and at Alpine Infusion there’s nothing but the highest quality chalets. 25 accessible summits, 321 Alpine ski runs, 169 ski lifts and over 600 kilometres of interconnected ski runs are at your disposal. Visiting the Three Valleys more than once is common practice, and you’ll find something new with each trip. The Three Valleys may be tightly associated with snowy ski sessions, but there are heaps of alternative activities available throughout the year. Even during the sunnier season! Enjoy hiking throughout the mountains discovering the impressive terrain, scenery and views. This is an excellent place for mountaineers, bikers and explorers, with miles of path to conquer. Be sure to bring your walking boots! You’ll also want to make the most of the excellent shopping opportunities and bag yourself some gifts to take home. Spending cash is a must. In need of boosting your skills when it comes to the ski slopes? There are so many pistes, resorts and options at your fingertips that finding a routine and a starting slope is an easy task. Tailoring your skills and building up your confidence is a fantastic experience in the Three Valleys, as you learn surrounded by picturesque alpine scenery. If restaurants, night time bars and cafes are your priority, then Three Valleys has got you covered. Each of the resorts available has its own unique atmosphere, social life and night time vibe, offering fine foods, alcohol and atmosphere. Be sure to book a trip during more festive seasons, as special events and unique performances will be available. 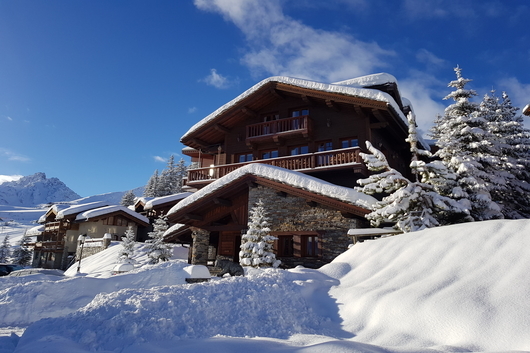 Larger resorts, such as Courchevel and Méribel, offer up a variety of activities throughout the year, even in the less-than-favourable January month. So make sure to research what’s happening at your chosen resort before you travel! The Three Valleys is one of the best places to bring a family or large party for a collective skiing experience. If expert slopes are more your area of expertise, you can choose to take on the more intense black pistes, or soften the experience with a green run. It’s up to you how intense you make your holiday, and any level of ability is welcome at the Three Valleys! Plan ahead and look up the slopes available to you during your trip. Picking out the ones you want to descend will save you time and free you up for more sessions on the skis! Feeling convinced? If you’re looking to head to Courchevel or Méribel, get the highest quality experience with Alpine Infusion. You can choose from a range of award winning, luxury chalets that provide a cosy atmosphere and world class service.